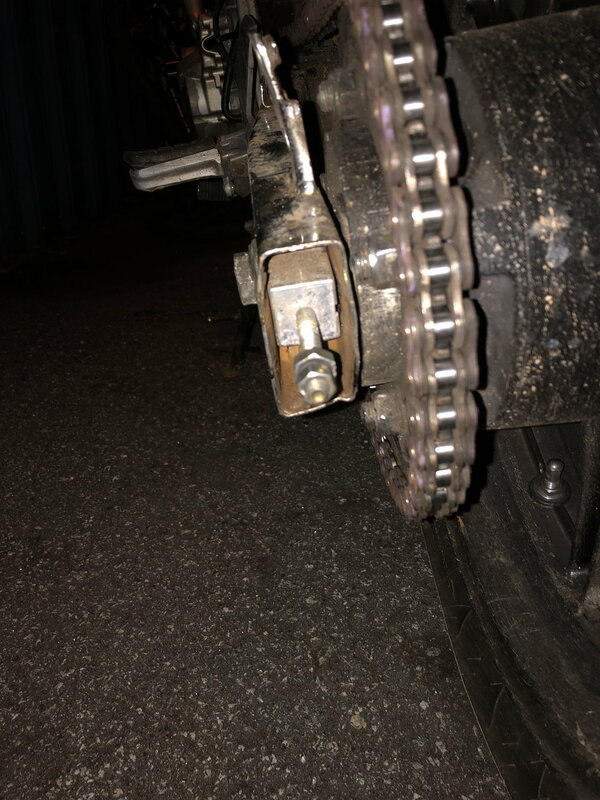 Was riding down the road the other night with some of my buddies and the plate that goes on the end of my swing arm cracked in half and caused the axle to go forward and the chain to fly off the rear sprocket and the wheel to go crooked. The end of the swing arm is bent a little after the plate broke. Managed to stay up but gave me a little scare. Anyone else have this problem? This is the first time I've heard of that. My initial thought is that you have the sequence of events wrong. That plate doesn't hold your axle in place. It's thin and it's cast. It's not meant for strength. It's more for adjusting the axle. The axle, spacers and axle nut clamp your axle in place. If you axle was loose for some reason, it would slide forward and back and that's what broke the plate. The question is - why was your axle loose? Have you had the rear wheel off recently? Check the threads on the axle, I've had a couple axles strip with age. Make sure the spacers are all in the correct places. Make sure the rear brake caliper bracket is installed correctly. Make sure you have that weird washer thing behind the axle nut. I imagine that was quite alarming but you got away with it mate. This should not have happened. If your “adjuster” was used for “tensioning “ then this could have damaged the plate you speak of. Check your using correct method and sequence for adjusting the chain or wheel removal/replacement and if your not happy with how tight things should be just use a torque wrench to confirm. Last edited by wes 17; 03-04-2019 at 09:37 AM. To break or not to break? Chain Knocking sound when applying rear break.